For this twenty-seventh episode, I talked to Cody Candee, co-founder of Bounce, who aim to give you place to leave your things anywhere in the city by providing short term bag storage in hotels and shops. 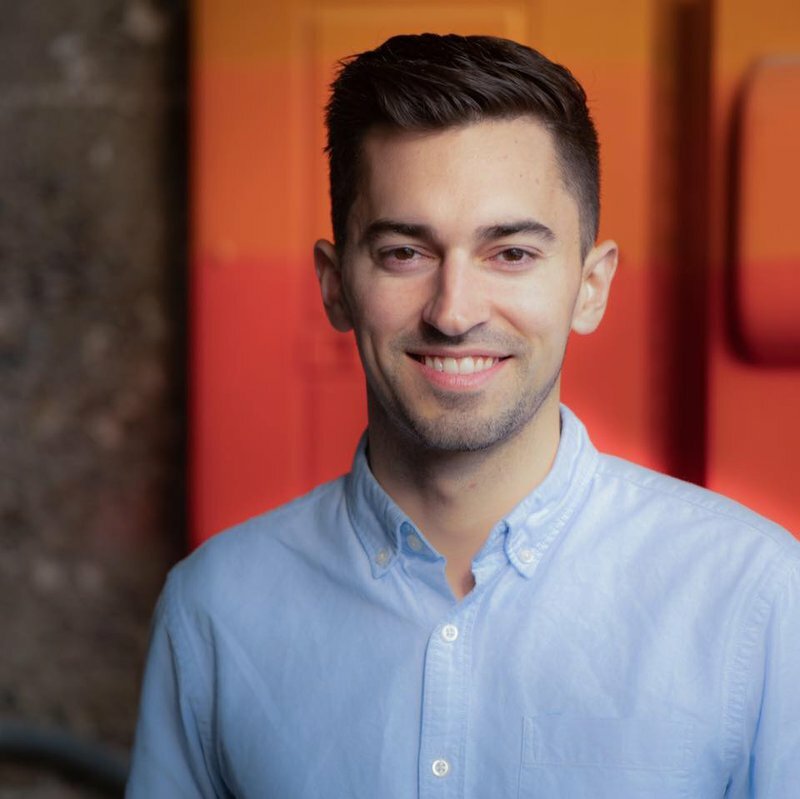 Before starting Bounce, Cody worked at Intuit, the makers of the accounting software Quickbooks, and at the venture studio FactoryX. That’s where he learned about the importance of rapid prototyping and how it should be done, so that you can find the right approach with your startup in the fastest way possible. We talk about his long term vision with Bounce, what he learned by starting off as a product manager, Bounce’s weekly planning horizons, how to close investment deals, and why you should take all advice with a grain of salt. Jeroen: Hi, Cody. It’s great to have you on Founder Coffee. Cody: Hey. Thank you so much for having me, Jeroen. Jeroen: Your are the founder of Bounce Bag Storage. I’m saying it right? Cody: Yeah, that’s correct – Bounce. You can find us in the App Store with Bounce Bag Storage, and then our URL is usebounce.com, but we just go by Bounce. Jeroen: Yeah, I suppose because the Bounce domain name was already taken by someone. I guess it’s a popular domain name. Cody: Yes, exactly. That’s right. Jeroen: What is it that you guys exactly do? It says Bounce Bag Storage, what does that mean? Cody: Yeah, that’s right. So Bounce is a marketplace for super-short-term storage. People leave things with us for five hours at a time, that’s the average. Basically, we partner with local hotels and shops to basically put up all these storage locations all over the cities. If you’re running around the city, whether that’s as a traveler or as a local, or you’re going through an event, you don’t want to carry your things, basically open our app, and you can find a place anywhere you are to leave your things. The closest alternative is something like train station lockers that you might see in Japan, Asia or Europe. Jeroen: Yeah, I’ve personally used something like that in Lisbon. It was in a parking lot. Is this a kind of thing you do as well? Cody: We don’t use parking spots, we use just go with local businesses or hotels that are manned by people who can check your items and then make sure that they’re safe. Jeroen: Oh, okay. So it’s not really like a locker. It’s more of a storage space where you leave your luggage at a hotel after you have checked out. Kind of like that? Cody: Correct, yeah. That’s right. Jeroen: Oh, that’s cool. So you’re kind of using the existing infrastructure, and you can scale much quicker, I suppose. Cody: Yeah, we have no assets. Jeroen: Is the business mostly directed at travelers, or is there any other group that makes use of this? Cody: Yeah, absolutely. I had basically the vision for Bounce, which I’ll explain, and the problem for Bounce, which is that people spend too much time planning their days around their things. These are things that I’ve thought about for years and years, and have a lot of personal experience with. Just a little context, a little backstory. I lived in 12 cities myself. I’ve traveled to about 50 countries. As a result, I’m very much a minimalist. I don’t own a lot of stuff, and it’s easy for me to move to a new place or travel. I’m not really bringing anything with me. I wrote a blog post about it, Traveling with No Luggage, An Experiment. Went to Hong Kong for a weekend with no luggage. And yeah, basically just saw this problem over and over again of people planning their whole days, and even their whole lives, around the things that they own. “Oh, I’m not going to this place because all my stuff with me,” and they go way out of their routines just to drop something off. Cody: So, basically, that led to the vision of Bounce, which is, imagine if anywhere you are in the city you can just summon your things away from you and summon them back to you. There’s sort of two ways to think about this, and we’re actually doing our experimenting with both. There’s storage, what if there was just a place you could check your things in anywhere, and then the original idea for Bounce was actually more of a delivery model. It was, what if someone just comes and picks up your stuff right away and then brings it back to where you are later? Cody: You think about 2014. That was when on-demand was really taking off – Uber, Lyft, and I was just thinking, “How crazy is it that so many people that live in cities really plan their days around their things?” I was just thinking there’s got to be a better way, and it basically all hit me right then and there – the name, the problem, the vision. You never plan your days around your things again. You can summon them away from you and summon them back to you. Jeroen: You Bounce them off, or what’s the name, what does it stand for? Cody: Yeah, that’s right. It sounds like you were kind of alluding to it. The idea is you could bounce your stuff away from you and then bounce it back to you. Yeah, it’s not delivery, because delivery is like point A to point B. Bounce means you move something away from you, and it bounces back to you whenever you want and wherever you are. Jeroen: Okay. So currently you’re doing the storage space, because I suppose that’s easier logistically. But at some point, would really like to make this a full Uber experience where you just tap on your phone and somebody comes to pick up your stuff and then brings it back when you tap again? Cody: And then, long story short, we put a bunch of prototypes together like in a day, in a couple of days, one after another, just quickly iterating, and we landed on a model where people would drop their things off in a store and then pick them up from another store. And we would do the logistics in between. But there were enough people that were willing to drop off and pick up from the same location, and we were just like, “That’s so easy to build. We could put that up in three weeks.” After that we started writing code, put our product live three weeks later. Basically had a fully functioning product and that was really the first phase of Bounce. Jeroen: Okay, so at a later stage you could charge more if you wanted to pick it up from another shop or something? Jeroen: That’s cool. You said you were going to share a bit more about the founding story? Cody: Yeah, absolutely. I think a lot of people find this interesting. We had the vision, we had the problem. But we had no idea what to build, and a big, exciting part of product building for me was my background in product management. It got the sort of rapid prototyping approach to things. I spent a lot of time with that, doing that in my career. So, basically, day one of Bounce with my co-founder, we put up a landing page, just like a website built in the most basic way – we did it in two or three hours. We bought some Google adverts, and on the page we basically said that we’ll come and pick up your stuff and bring it back to you. Cody: This was in New York City. My co-founder and I got Citi Bike memberships, and then literally five minutes after putting the Google adverts up, someone calls my phone and says, “Hey, can you come pick up my bag?” And she was like, “How much does it cost?” I quickly hit mute, and I was like, “Hey, Alex, Alex. How much should I charge them?” We basically just put something live that seemed like it could be real, and basically used that to get real customers that then we could build the product around. Cody: That’s when we basically decided how much we want to charge this person, decided how we would handle it all, and literally fulfilled our first 20 orders of Bounce on Citi bikes. We showed up to meet this lady at a Starbucks, and it’s funny, but we did a few things to make it seem a little bit more legitimate. We brought another suitcase with us so we could say, “Oh, yeah, you know. We’re Bounce. We deal with more suitcases than just yours.” Later we told her she was our first customer, and every commitment we made to her as a customer, we fulfilled. But we really hustled our way into getting Bounce off the ground really fast. Cody: The way that we were thinking about it was, Bounce seemed like a really crazy idea, and so we took a scientific approach to what are the hypotheses that have to be true for Bounce to work. The biggest one was, are people willing to hand their valuables, hand their bags off to strangers that they met off the internet? If the answer was no, then game over, we don’t have a business here. So we said, how can we test that assumption as fast as possible? So with that first customer, she actually asked us “where’s the van”, “do you work on a street”. But overall, it wasn’t really a problem. She handed her stuff off to us and we got it back. There is some hesitation from folks, but generally speaking, a lot of people are willing to give their things to a stranger. Cody: So we validated that, and then from there, the next phase was, all right, this logistics piece is actually really hard. Riding around on Citi bikes was really exhausting. It seemed unlikely that we could pay drivers enough money to make this work, like all the logistics issues, and so that’s when we said, all right, this is the next thing that would be most likely to break the business, so how do we solve for that? And then from there we came up with the next model, and then just kept iterating. Cody: So there were three weeks of really, really intense prototyping. Just taking customers as fast as we could and iterating every day, and then that’s what led us to the conviction. We already had the conviction around the problem and the vision, but that’s what gave us the conviction that we can actually build something. Customers wanted this, and we can make this a really exciting business. Jeroen: That’s really solid advice. I just had a chat with someone yesterday who wants to basically join a new business, or sometimes I have a chat with someone who wants to start a new business and ask, “How should I do that?”, and really, the rapid prototyping approach that you just explained is what you should do. Most of the world expects you to come with a complete plan, like you write 40-page business plan and then you just execute it, but that’s not how entrepreneurship works. Jeroen: It’s really like trying small things, and then trying the next thing. Even if you already have a business, it’s often the best way of improving it. This is, I think, a really great example for all the listeners that are thinking of doing something new. Just try the easiest way you can, and then try the next thing, and then try the next, and see where it goes. Cody: Exactly, yeah. No matter how good you are, it is very difficult for anyone to predict customer behavior. And so, if you spend nine months developing a product without putting it in front of customers, you just spent nine months and you don’t know how the customer’s going to respond. And often companies, big and small, do this, and then the customer uses it in a different way, or there’s a certain thing, like in this example, “Will I hand my bags over to strangers?” If that didn’t work, we’d have to completely rethink it. Cody: So flipping it around and saying how can I get customers first, and have them tell me what to build, or have them guide us in what to build, it can really help you shortcut a lot. We grew Bounce pretty quickly with the timeframe that we had, and I attribute a lot of that to rapid prototyping. Just letting customers tell us what to build rather than us trying to guess. Jeroen: Yeah. You said you did a lot of rapid prototyping in your career previously, what is it that you were doing previously? Cody: Yeah, so, there are two relevant examples. I started my career out of college at a big tech company in Silicon Valley, Intuit. Intuit has an amazing program for folks starting a career in product management right out of college, so I joined their rotational program. It’s amazing training, but they also just throw you in right away where you’re then owning a big product experience. This was 2012, a big thing they preached then was the lean startup. It was right when the book came out, and actually, Intuit’s mentioned all over the book as an example of a big company that’s actually able to do this. Cody: So they really drilled it into their new hires, like, “This is how you do rapid prototyping. This is how you do the lean startup approach. Talk to customers, talk to customers, talk to customers.” No one does that enough, even me, who has been thinking about this forever. And whenever I talk to customers, I’m like, “Ah, I should do this more often.” So that was the first real taste of this. Cody: Then the second one was when I had the opportunity to do a fellowship with a venture studio called FactoryX, which was led by Tom Chi. He was on the founding team of Google X, Google’s experiment lab that incubated self-driving cars, glucose contact lenses, Google Glass, all this stuff. So their approach too. If you search for rapid prototyping, Tom’s name might show up. He’s sort of a pioneer in it. He really had a methodology similar to the lean startup, but a little different. It was just how do you spin out products really fast by using customer validation and prototypes that are often no-code-written, certainly no back-end-code-written. But you just put the value proposition of the experience in front of the customer and watch how they use it and respond to it. Jeroen: Do you have any concrete examples of how you were doing this at Intuit? Cody: I worked on this with a couple of people. We talked to a lot of tax experts, and it was really interesting. There were a few key insights that we could have never guessed, no one could have ever guessed, and when we just put this in front of people and talked to them, we revealed them all. I won’t be able to remember all of them but I remember there was a big one around demographics. There were folks that made below a certain amount who just had zero interest in this. Like hey, you don’t want an extra $500 on your tax return? Yeah, there was a group of people that was just not at all interested. Cody: I think there was another one around people. That they don’t want to think about their taxes when it’s not tax season. So that was another thing to work around. There were a few really key insights like that. I wish I had all the notes to tell you all of these counterintuitive insights that we picked up. Jeroen: Cool. So you say you started at Intuit straight out of school? Jeroen: What did you study before? Cody: I started college with going for a business degree and then narrowed it down to a finance degree. I like math, and was kind of going down the general business route. Then halfway through college, I was thinking about what I wanted to do, and it took me until the middle of college to realize two things. Cody: One is that I’m very entrepreneurial, and I realized I could connect the dots between entrepreneurship and career, like, “Wow, I can actually make a career out of this”. Then the second one was my passion for the technology industry. I realized halfway or maybe three quarters of the way through college that the only industry that I wanted to work in is technology. So, yeah, basically I then started spending more of my time and more of my focus to align myself with opportunities in that realm. Jeroen: Yeah. I suppose you started as a product manager because you kind of felt like you had your own product and business to run? Cody: Yeah, that’s right. I think product management is a great experience. You’re working with engineers, designers, cross-functional teams to basically figure out what to build, and that, to me, felt very similar to what a tech entrepreneur would do. It felt like the best thing I could do to prepare myself to be an entrepreneur later. Jeroen: Yeah. That’s funny, I had the exact same thought when I came out of school. Jeroen: Yeah, but I did it in a pharma company, and that was a horrible mistake, because it doesn’t mean the same thing as it does mean in a tech company. Jeroen: Yeah. I studied engineering and biomedical engineering. I figured that a pharma company would be the same thing for me, but in the end, it was more of a marketing position without a lot of other responsibilities. Not like in a tech company. It’s a totally different thing. Jeroen: So I kind of understand Bounce and your backstory. Where is it exactly that you want to take Bounce? You mentioned a few things already, like it needs to kind of become Uber for your goods? Is that how you would describe it? Cody: Yeah, I alluded to a big vision that we’re really excited about. Keep in mind we’re thinking decades out, our big vision is the sort of magical world where anywhere you are in any city, you can access your things wherever you are. The status quo today is you probably keep all your stuff in your house, maybe you have a storage unit too. But for the most part, you keep everything that you need regularly in your house right in the front, and you bring it with you everywhere you go. Cody: The futuristic world is, anywhere you are in any city, you can just summon your things to you. The analogy we use is cloud computing for the physical world. There’s distributed storage all over the city, and you can access your things pretty much anywhere from those spaces. So the storage is a huge component of this. But we’re also, we’re really excited about the idea of being able to summon anything from anywhere. It’s a big, crazy vision, and there’s no direct path to getting there, but we realized the base layer was storage. So we built that, and then we’ve also been looking at what it would take to add a courier layer on top of that. Jeroen: So do you focus on short-term storage, or is it also long-term storage? Are you willing to compete with Shurgard, or is it mostly competing with logistic systems for goods? Cody: Long-term storage is a whole different industry, but we want Bounce to be the interface between you and everything you own. If Bounce is sort of the interface, we want to have connections to longer-term storage facilities. So with Bounce you can send something to a longer-term storage, but we may not ever build our own long-term storage business. Jeroen: You stay focused on the service and logistics, and storage itself you keep outsourcing, at least for now. Cody: Yeah, I think we could build a really, really big impactful technology software platform without really investing in any assets. We can connect consumers to all the spaces – connect them to other nodes, like longer-term storage, just to build out this incredible platform for moving and storing things around a city and managing how you access your own things. Jeroen: I’m supposing you are not looking to build this in a bootstrapped way. It’s like virtually impossible? Cody: Yeah, I think we could play the bootstrap game with this, and it would look a little different. We could play the venture-backed game, and we can drive more towards that big, big crazy vision. So, yeah, last summer, we actually raised our first round of funding, a little over a million dollars. We were a bootstrap nine months before that, but the money was actually really helpful. It allowed us to take bigger risks, to spend more than we’re doing in revenue, investing in engineering talents and other talents. It’s been really exciting. We’re in a great spot with growing revenue, but having the ability to make really forward-thinking bets has been incredible. Jeroen: Yeah. What is it that you spend most of your time working on lately? What is that keeps you up at night, let’s say? Cody: Yeah, actually, every week is pretty different. Every week on Monday the team gets together, and we talk about what’s the most impactful thing we can do. Some weeks it’s just growth, it’s just how do we get more growth, what growth features do we build. This week it is operations and scalability. We doubled our revenue last month, and we’re on pace to double it again this month. It seems every time we 10 X our revenue, things start to break. Cody: And when I say things start to break, I mean the customer support queries might get too high and it kind of gets messed up. Or the way we think about managing our store partners. Where it was high-touch before, we need to think about it more in a systems approach where it’s, “Here’s automated information that goes out,” and rather than managing 150 partners, we’re managing one system that helps them get the information they need. We’re still available for them. Cody: So yeah, this week and next week, it’s all about scalability. How do we make Bounce more operationally efficient. And then the future weeks will really unfold as we progress, but there’s some tech work we need to do next around scalability as well. Jeroen: Yeah, so you have a really short horizon on what you do. It’s like you plan for the next week? Does that mean you don’t do longer-term projects? Is it always limit to things you can do within a week, or how does that work, exactly? Cody: It is everything, so weekly is a big one. I can tell you, we actually kind of do quarterly as well. We say, “What do we want to accomplish this quarter,” but sometimes predicting three months out, what’s going to unfold in the first two months will really reveal the third month, so the longer-term goals that we have, we keep more broad. Cody: We say, “This is our vision. We want to work on things that point us towards that. These are goals we’re working backwards from,” and with all that, we say, “What should we be doing to get closer to that?” But if you ask me what we’re going to be doing, how we’re going to be spending our time in June, maybe I would say high-level growth or X, Y, Z, But what we learn this month and next month will really pave the way for that. Jeroen: Cool. How many are you now? Cody: We are four or five employees. We just brought on a new engineer, so we’re three engineers including my co-founder and CTO, Alex, and then we have one other person on the non-technical side. Jeroen: Yeah, so it’s really like despite the fact that you raised the million, you are still keeping things very lean and quick. Is that how I need to understand it? Cody: Now we’re still very frugal, but if it’s like, “Hey, here’s 500 dollars, here’s what we might learn by doing this. There’s a 50% chance that it’ll work and a 50% chance it won’t. If it does, then we can scale this up and it would pay for itself in this way.” We make a lot of bets that way, but we still are pretty frugal. We definitely have not increased our spend too much. Jeroen: Is that something you plan on doing in the long-term? What’s your idea on this? Cody: I think it’s a huge benefit to having this mindset on always be operating at maximum efficiency. I think there are huge upsides to that. I think the downsides are where you don’t make bets that you should, and when you are too frugal, that you’re missing out on things. If you’re a billion-dollar company and you try to save like 10,000 dollars on something, 10,000 dollars is literally immaterial. It’s a rounding error. Cody: And so, as we grow and expand and something like a thousand dollars becomes completely insignificant for us, it’ll be important for us to say, “Yeah, actually, if we can spend a week of work to save a thousand dollars, actually, that’s a horrible use of our time. Let’s not do that.” So I think it’s striking the right balance between maximizing efficiency, but also not doing small-value things. Jeroen: Yeah, I get it. It’s also that you don’t want to be frugal, because then you don’t have budgets for experiments that you should have done. Jeroen: But if you keep the pressure on the budget, then you don’t start throwing it around and just bring whatever experiment that comes into mind. Jeroen: Cool. What is it exactly that you do in the business right now? You’re five, so I’m supposing you do a lot of stuff? Cody: Yeah, my title is CEO, and basically, the focus that I have varies from month to month. Some months previously have been fundraising. I’d say the last month it’s been very product-oriented. It’s been very much figuring out what we should build, how we optimize around that. A month ago I was chatting with my co-founder, I’m like, “Hey, I think the biggest thing that would change the business is increasing our engineering velocities,” so then kind of mapping that out. Cody: And hiring, I hear a lot of people that are a bit bigger than us, they say hiring becomes the most important thing, and so I’m realizing, yeah, making sure that the right folks are on board, and we really start meeting people now that we might want to hire for a year or three years down the line. That’s key. It’s really just thinking holistically about the business and what’s going to drive it forward the most, and basically jumping into where I was the most needed at the time. Jeroen: Yeah. So is there anything that you prefer specifically over other ones, or is it all the same to you? Cody: I actually really love the variety of it. I love doing a different thing every month. Some of the more obvious stuff is boring, like a lot of just fixing operations and things like that, and I really like getting the right people on the right problems. That’s really fun to me, and a big part of that is sort of the product manager angle too of making sure we’re building the right things. Yeah, but I don’t have like one clear thing. Jeroen: Operational stuff doesn’t need to be boring. Cody: Yeah. I like watching it break and then figuring out how to fix it. But yeah, I’d say I have a high tolerance for letting things break and fix it rather than trying to invent the perfect thing straight upfront. Jeroen: Right. I think it’s probably good founder mentality, at least in the early stages. Cody: Yeah. As long as what breaks isn’t too much and the consequences aren’t too high. Right now there’s nothing that’s too extreme, so we’re in a good spot. Jeroen: Where is it that you guys are based? New York? Cody: We’re based in San Francisco. Jeroen: Ah, San Francisco. Oh, but you’re in New York right now, right? Cody: I’m in New York this week, that’s right. We actually got our start in New York. We were in New York our first nine months and then we moved out to San Francisco. Jeroen: Oh, that’s kind of like the guys at Airbnb. They did it the other way, I think. Right? Did you hear the story? Cody: Yeah, they started from San Francisco, but New York quickly became the biggest market. So then they spent a ton of time out there. Jeroen: Exactly. When you were telling your story earlier, I also had to think about Airbnb. How are you kind of trying to engineer an experience around having your goods bouncing off and all that. Cody: Airbnb is definitely an inspiration to me. The way that they took a really gnarly problem, or solution of letting people stay in homes and really designing that experience that builds confidence. There’s a lot of those same things we need to do. When you’re handing your things off to a stranger, you need a beautiful website and product, because that brings trust. You need to think through all these friction points in the customer experience and design around that. So yeah, I love reading and learning about Airbnb and then talking to my friends who work there. Jeroen: Cool. Slowly closing up, and also about books. What’s the latest good book you’ve read, and why did you choose to read it? Cody: Yeah, I read a lot. This year, I’ve been reading three to four books a month. The last book I read was “The One Minute Manager”. It was a really good short read around basically how to manage people, and I’d say that the key summary of the book is basically doing things in an efficient way where you’re letting employees really own what they do and sort of be the boss of themselves. And you’re just redirecting them and praising them for when they do well, and making sure goals are well-set. That was the last book I read. Cody: The best book I read in the last few months was probably “The Everything Store”, which was all about Amazon. That was super-fascinating, because Amazon is such a big company that’s in all of our lives now, at least in the U.S., and I know in many other parts of the world. And reading about the times where they almost failed, they built themselves to a decent size and then almost got crushed. It was so fascinating. Cody: And then seeing how they worked through different decisions and how they got their start, you know, a bookstore, and then thinking about things like, “What’s our competitive advantage”. For them it was the more volume they could do the lower the price is. I learned a ton from reading that, and definitely recommend that book. Jeroen: Yeah. I agree. I also read it. I didn’t read The One Minute Manager yet, I just put it on my Goodreads list. Sounds like a book I should also have a look at. I read some similar books lately. Did you read the one, “The Hard Thing About Hard Things”? Cody: I did, yeah. That was a great book. Jeroen: Yeah. It was an amazing book as well. So is there anything you wish you would have known when you started out with Bounce? Cody: You know, whenever I reflect back after a month of time or three months of time, I always think of so many things. With fundraising, for example, there was a ton. It’s easy to think about it as sort of meritocracy where you work hard, you do well, and you raise, but there’s actually such a game to it. There’s all these little tactics. Like, I wish that I had not spent as much time as I did with investors who don’t lead or who don’t write cheques until there’s another lead. I could have saved a lot of time that way. Cody: With hiring, there’s things like understanding the impact of the industry that you’re from and how that bleeds into your work. There are so many things where I’m just learning every day, and I’m like, wow. The way that I’m going to do other things going forward will be different based on what I learned, and if I knew all this stuff before, I would be able to take more shortcuts. So there are many, many things. Jeroen: What’s the biggest thing you have learned in raising money? The biggest trick, like you said. Cody: Yeah, I boil it down to like one major thing, and it’s kind of funny and a little bit sad. The number one reason an investor invests is the conviction of other investors. That is true for most investors. Not all, there are some fantastic investors out there. We had some who just loved the idea and wrote a cheque, but for the most part, a lot of investors I met with, if other investors are investing, that pushes them over the edge. That gives them a sort of like, “Oh, I need to look at this company.” The takeaway from that is, given that that’s the case, you need to focus on meeting with folks that will write cheques first, and then focus on everyone else later, because that’ll be the tipping point. So, yeah, that’s definitely the number one thing on the fundraising side. Jeroen: Are we talking VCs now or angels? Jeroen: When you’re talking about a group then, like with VCs, you’re not going to sign with more than a few. Right? You won’t have that huge a space. Cody: Yeah, that’s true. But if a VC hears about another great firm that is getting ready to write a cheque, they’re going to want to jump on that. Jeroen: What kind of stage do you think you need to be in, like, right before actually writing the cheque, or does earlier stuff work as well? Cody: Yeah, I think throughout. Having lived in San Francisco for a while I have a lot of friends that are in the VC industry. It’s basically like everyone’s trying to learn what the other hot deals are at the time and then get in them, and so the best deals happen really, really fast. So I would say a good percentage of a VC’s job is to meet other VCs and stay in sync and all that, and try to figure out where the deal flow is, and then which the hot deals are, and make sure they get in front of that before most other people do. Jeroen: Cool. Final question, what’s the best piece of advice you ever got? Cody: Best piece of advice I got is probably trust yourself, or take all advice with a grain of salt. You can hear advice telling you one thing, and great advice from another absolutely experienced person on something exactly the opposite. No one will know your situation better than you. I think it’s great to go out and get advice and learn from people who’ve done it before, but at the end of the day, it all comes down to you and what you think is right, and you know the situation better than any expert. I had some friends push me and said “Hey, Cody, just trust yourself.” When I was thinking about quitting my job, there were friends that said, “just trust yourself”. It’s like, making this decision, just trust yourself. That’s probably the best advice I’ve gotten. Jeroen: That’s probably the most meta “the best piece of advice I’ve ever gotten” I’ve ever got. Jeroen: Thank you again, Cody, for being on Founder Coffee. It was really great to have you. Cody: Yeah, thank you so much for having me. This was really fun. We hope you liked this episode. If you did, review us on iTunes!